Do you want to see the disgusting lump? If you do, read further. If you really don’t, VirtuaVet has lots of pretty stories for you on other posts! You may have one of those types of bumps on your dog now. You know, the lump that’s been there a while, the vet looked at it a year or more ago and thought it was okay, your dog is a little elderly, the money’s a little tight for frivolous surgery “just to be safe.” You know, probably millions of pet dogs have one, two, or ten of these lumps now while you are reading this. It’s like a lump lottery. You hope you choose right. You hope everything will be okay. Usually it works out. 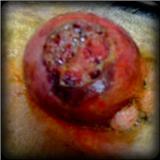 “If the skin stays intact over a lump, then the immune system can keep out everyday infections. Once that skin breaks open, for whatever reason, infection can set in. Because the lump is not normal body tissue, infections can take hold and never go away, no matter how strong the antibiotic medication. And, the skin over the lump will not heal like normal skin. You’re almost always facing a surgery to keep quality or life and good household hygiene,” says Doc Truli. 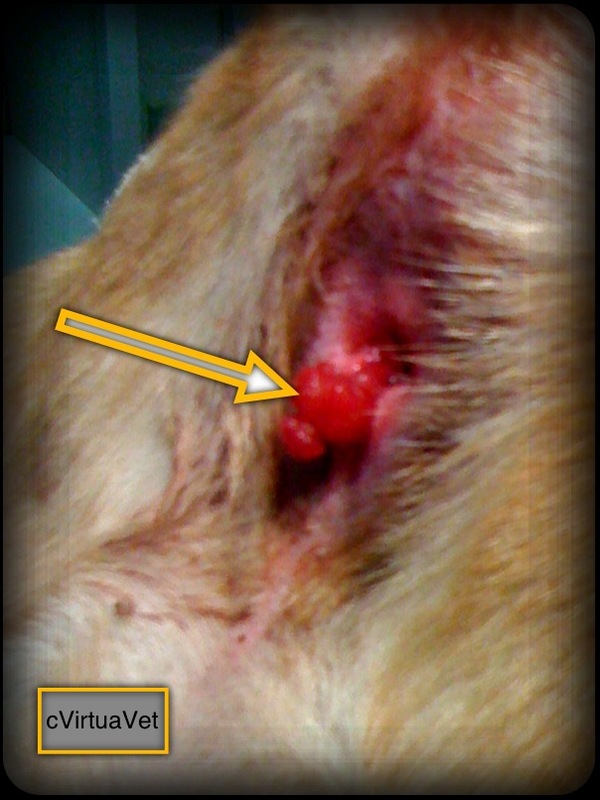 Bailey (the carrier of this particular shocking lump) underwent some surgery to remove the offensive bump. 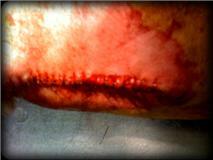 Pretty suture line sure beats ugly bump! The resulting suture line sure looked better than the original lump! If you cannot afford a whole surgery, do not skimp on safety and comfort measures, like intravenous fluids and pre-operative laboratory testing and post-operative painkillers, unless your veterinarian advises you they are not needed. Doc Truli believes knowledge truly is power, so the added cost of the histopathology can give gains and insight in the future that cannot be anticipated today. True, they are theoretical benefits, but if you can, follow your veterinarian’s advice! The tumor cut in half. The doctor still cannot diagnose the tumor just on the looks of it! 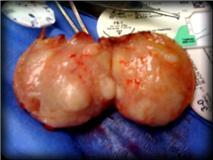 This soft white to tan fatty-looking tumor had round areas of white material in it. 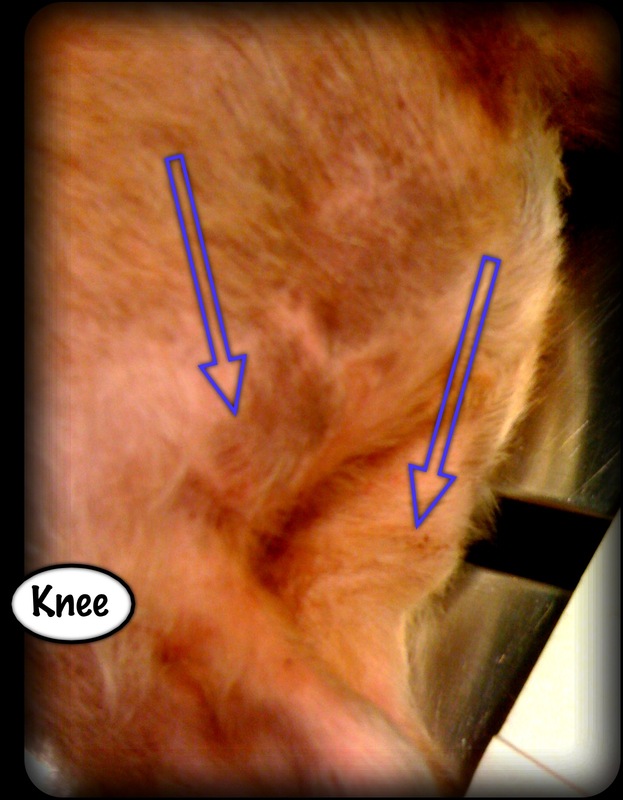 Hopefully, it is a lipoma (a fatty tumor). But it could be lymphoma, mammary cancer (even on a boy, they have mammary tissue, too), or many other kinds of cancer. Bailey is 15 years old and his mom felt like he was lucky to have made it this far! She’s not too worried about another tumor at his age. He pulled through the surgery just fine. The huge Elizabethan collar prevented Bailey from chewing at his suture line. 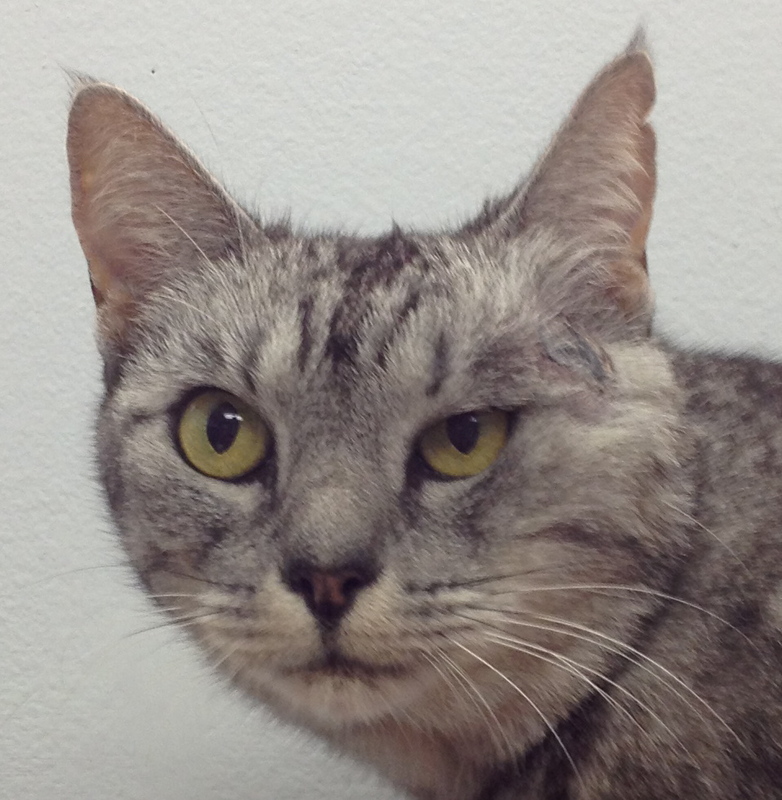 Over the years, Doc Truli learned not to trust Bailey with sutures. But that’s a story for another day! P.S. 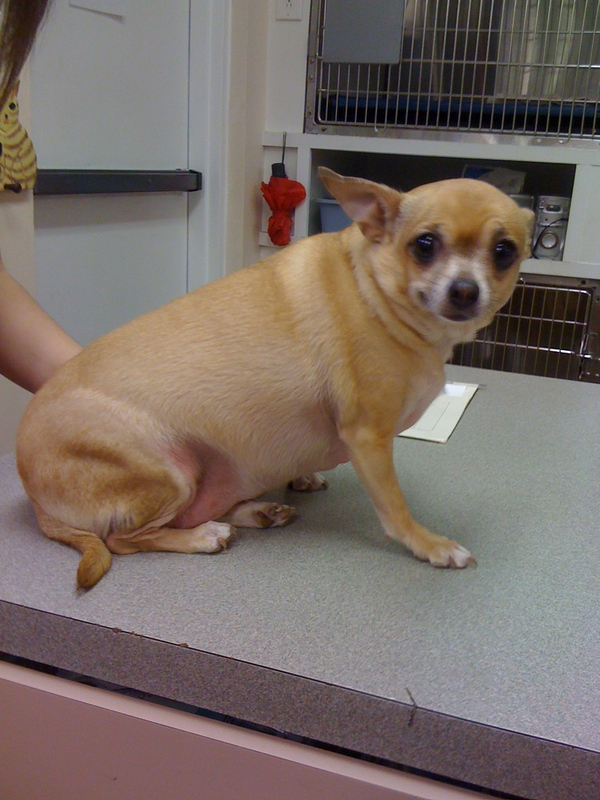 VirtuaVet’s Lump or Bump TAG will give you a big list of posts about other lumps and pictures. Let us know if we’ve helped you help your dog with inspirational stories or information! PS. Definitely not enlarged testicles… They were too low. I know that happens but these tumors were clearly attached to the backs of his thighs. Hi, Doc. I’ve spent about four hours now reading posts on this blog ever since finding it yesterday. I am a lifelong animal-lover, especially of horses, dogs and guinea pigs, and originally planned to be a vet. I worked as a tech for a while, in three different small animal hospitals, and saw many interesting cases along with a lot of standard issues. I realized after a while (and a couple years of college) that becoming a vet was not my true calling, but I remain extremely interested and fascinated by veterinary issues. So your blog has been a regular magnet! Anyway, I am constantly interested in animal welfare and notice when people are clearly not doing the right things by their pets. One thing I saw pretty recently absolutely appalled me, and this post reminded me. It was a Shar-Pei dog, full-grown, that I spotted at a horse show. He was in good weight and was trotting along behind his owner, not lame. 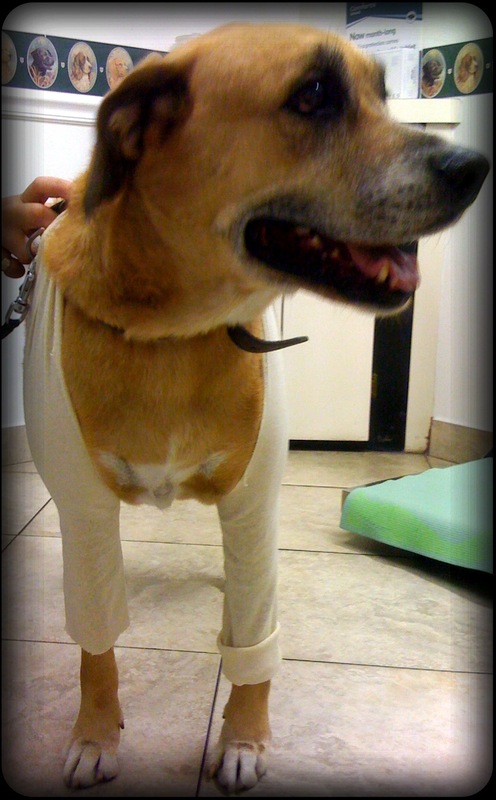 Unless you noticed the two ABSOLUTELY ENORMOUS tumors he had, one on each hind leg! They were about the size of baseballs or softballs and dangled loosely, fully encapsulated and flapping away as he moved. What on earth could these have been? And WHY had they not been removed? The poor dog! Yes, he had to swing his legs out of the way to walk or trot. Seems like it would be a simple surgery to cut the skin and remove them. I was horrified and I could see other people following this dog with their eyes and whispering. Your thoughts? Every surgery is a decision to “first do no harm,” and to try and make the pet’s life better for having had the surgery. Even though the tumors you saw were enormous, I can think of a few quick reasons why they were not surgically removed. 1) Perhaps the dog has a cardiac condition and surgery is deemed likely to kill him or her. 2) perhaps the dog had a terrible recovery from previous anesthesia and they believe more anesthesia risky 3) The dog could have hemophilia, von willebrand’s disease or some other rare clotting disorder that makes post-surgical bleeding potentially deadly, or 4 ) the dog could have other or multiple illnesses that are killing him or her much more quickly than the tumors. Like brittle diabetes, or liver or kidney failure. Philosophically speaking, we should ask ourselves whether we are in a position to judge the situation and whether it is our business to get involved. It is easy to see what we see and assume something wrong is being perpetrated. I prefer to assume people do the best they are able to do and I get involved if they ask for help, or if it is my business to help. That said, I do often see arthritic dogs walking as I drive down a street and wonder if their veterinarian is providing all the modalities of care that I know. I long to stop and ask if I can help further. Can you imagine how terribly that conversation would go most of the time? For certain, any time I witness as situation with a pet or a person that I think is amiss, first I think “am I doing the same thing in some way?” We can control our own actions and thoughts and it really, ultimately, is our responsibility and our business to keep ourselves in order so that someone else may not have the burden of looking at us and wondering whether they should say something or not!